Citrus zest is a wonderful ingredient to have up your sleeve to add brightness and nuance to a variety of dishes, sweet and savory. It's best to use organic fruit, but if you only have conventionally-produced citrus, make sure to wash off their waxy coating before zesting. 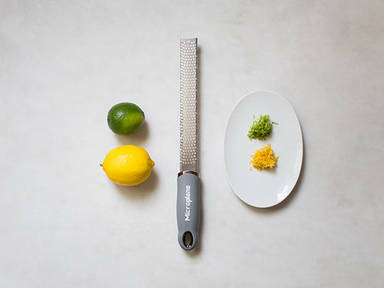 Use a fine grater to gently scrape the zest off the surface of the fruit, being careful not to go too deep into the white pith, which can be very bitter. Lemon, lime, orange, or grapefruit zest are a perfect addition to salad dressings, savory sauces, cakes, icings, and more. Their tangy flavor provides a great contrast to sweet, bitter, and umami flavors, and can often breathe life into otherwise ho-hum food.